With this post we’re back to a topic that is high on our list of important issues for ensuring a strong safety culture - and one that doesn’t seem to get a lot of attention by the industry and regulators. It is the critical importance of how safety values are integrated into decision making processes, particularly for decisions that involve balancing other business priorities and where the safety implications are not clear cut. Isn’t this also true for the nuclear industry? The term “experiential learning” certainly caught our eye as we believe it is consistent with our own focus on developing simulation tools to provide a realistic decisionmaking environment - where trainees can practice managing the conflicts they will inevitably confront on the job. *"Promises Aren't Enough: Business Schools Need to Do a Better Job Teaching Students Values," Rodrigo Canales, B. Cade Massey and Amy Wrzesniewski, The Wall Street Journal, August 23, 2010. Posted by Bob Cudlin 0 comments. Click to view/add. On August 23, 2010 we posted on a paper* reporting on a safety climate survey conducted at a number of off-shore oil facilities. We noted that paper presented a rigorous analysis of the survey data and also discussed the limitations of the data and the analysis. Our Bob Cudlin has been in contact with the paper’s lead author who provided a candid assessment of how survey data should be used. * Mearns K, Whitaker S & Flin R, “Safety climate, safety management practices and safety performance in offshore environments.” Safety Science 41(8) 2003 (Oct) pp 641-680. Posted by Lewis Conner 1 comments. Click to view/add. In our August 11, 2010 post we quoted from a paper* addressing safety culture on off-shore oil facilities. While the paper is a bit off-topic for SafetyMatters (the focus is more on industrial safety and individual, as opposed to group, perceptions), it provides a very good example of how safety climate survey data should be collected and rigorously analyzed, and hypotheses tested. In addition, one of the findings is quite interesting. The researchers knew from survey data which respondents had experienced an accident at a facility (not just those facilities where they were currently working), and which respondents had not. They also knew which of the surveyed facilities had a historically higher proportion of accidents and which had a lower proportion. “In this case, . . . respondents who had not experienced an accident provided significantly less favorable scores on installations with low accident proportions. Additionally, respondents who had experienced an accident provided significantly less favorable scores on installations with high accident proportions.” (p. 656) In other words, workers who had been through an accident recognized a relatively safer (riskier) environment better than workers who had not. While this is certainly more evidence that experience is the best teacher, we think it might have an implication for the commercial nuclear industry. Unlike offshore oil workers, the overwhelming majority of nuclear power plant employees have never experienced a significant incident (we’re excluding ordinary personnel mishaps). Thus, their work experience is of limited use in helping them assess just how strong their safety culture actually is. Does this make these employees more vulnerable to complacency or slowing running off the rails a la NASA? Posted by Lewis Conner 0 comments. Click to view/add. NRC Chairman Jaczko recently gave a speech* where he presented three ongoing challenges to the nuclear industry: knowledge management, safety culture and public outreach. We applaud the chairman for continuing to emphasize safety culture. He indicated it was important to have a strong safety culture, all industry participants need to have a consistent focus on safety, and complacency is a potential pitfall. Unfortunately, he plowed no new ground in his remarks. We think the chairman should have mentioned the potential for lessons learned from recent disasters in other industries. In addition, with the U.S. nuclear renaissance trying to get underway, we believe he could have pointed out the need for a strong safety culture at all the players who will be involved in building new plants: designers, fabricators, suppliers, contractors, owners, and many others. * Jaczko, G.B., “Focus on Regulation.” Prepared Remarks for the Goizueta Directors Institute, Atlanta, GA, (NRC S-10-031) August 10, 2010. This quote comes from a paper [see cite below] we recently posted about and reminds us of our purpose in writing this blog. We have posted about Reason’s insights into safety culture and find his work to be particularly useful. We hesitate to exploit such insights for our own purposes but we can hardly resist noting that one of the core purposes of our SafetyMatters Blog is to share and disseminate useful thinking about safety management issues. We wonder if nuclear operating organizations take advantage of these materials and assure their dissemination within their organizations. Ditto for nuclear regulators and other industry organizations. We observe the traffic to the blog and note that individuals within such organizations are regular visitors. We hope they are not the exceptions or the only people within their organizations to have exposure to the exchange of ideas here at SafetyMatters. * Andrew Hopkins, "Studying Organisational Cultures and their Effects on Safety," paper prepared for presentation to the International Conference on Occupational Risk Prevention, Seville, May 2006 (National Research Centre for OHS Regulation, Australian National University), p. 16. Now from Australia we have come across more research results related to some of the key findings we discussed in our August 2, 2010 post “Mission Impossible”. Recall from that post that research comparing the results of safety surveys prior to a significant event at an offshore oil platform with post-event investigations, revealed significant differences in cultural attributes. This 2006 paper* draws on a variety of other published works and the author’s own experience in analyzing major safety events. 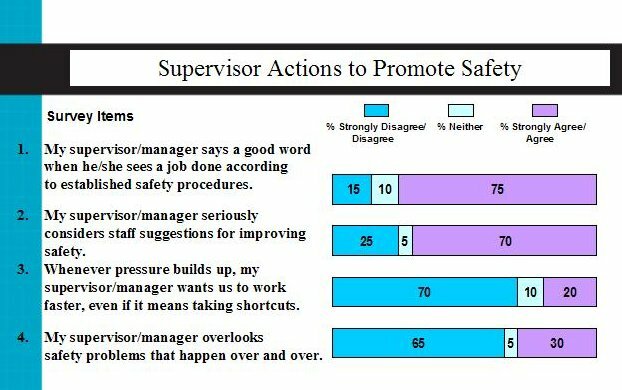 Note that the author refers to safety culture surveys as “perception surveys”, since they focus on people’s perceptions of attitudes, values and behaviors. “The survey method is well suited to studying individual attitudes and values and it might be thought that the method is thereby biased in favour of a definition of culture in these terms. However, the survey method is equally suited to studying practices, or ‘the way we do things around here’. The only qualification is that survey research of “the way we do things around” here necessarily measures people’s perceptions rather than what actually happens, which may not necessarily coincide.” (p.5) As we have argued, and this paper agrees, it is actual behaviors and outcomes that are most important. The question is, can actual behaviors be discerned or predicted on the basis of surveys? The answer is not clear. * Andrew Hopkins, "Studying Organisational Cultures and their Effects on Safety," paper prepared for presentation to the International Conference on Occupational Risk Prevention, Seville, May 2006 (National Research Centre for OHS Regulation, Australian National University). ** Mearns K, Whitaker S & Flin R, “Safety climate, safety management practices and safety performance in offshore environments”. Safety Science 41(8) 2003 (Oct) pp 641-680. To investigate the utility of safety culture surveys Antonsen compared results of a safety survey conducted of the employees of an offshore oil platform (Snorre Alpha) prior to a major operational incident, with the results of detailed investigations and analyses following the incident. The survey questionnaire included twenty questions similar to those found in nuclear plant surveys. Answers were structured on a six-point Likert scale, also similar to nuclear plant surveys. The overall result of the survey was that employees had a highly positive view of safety culture on the rig. The after incident analysis was performed by the Norwegian Petroleum Safety Authority and a causal analysis was subsequently performed by Statoil (the rig owner) and a team of researchers. The findings from the original survey and the later incident investigations were “dramatically different” as to the Snorre Alpha safety culture. Perhaps one of the telling differences was that the post hoc analyses identified that the rig culture included meeting production targets as a dominant cultural value. 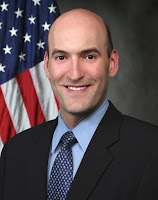 The bottom line finding was that the survey failed to identify significant organizational problems that later emerged in the incident investigations. Antonsen evaluates possible reasons for the disconnect between surveys and performance outcomes. He also comments on the useful role surveys can play; for example inter-organizational comparisons and inferring cultural traits. In the end the research sounds a cautionary note on the link between survey-based measures and the “real” conditions that determine safety outcomes. Post Script: Antonsen’s “Mission Impossible” paper was published in December 2009. We now have seen another oil rig accident with the recent explosion and oil spill from BP’s Deepwater Horizon rig. As we noted in our July 22, 2010 post, a safety culture survey had been performed of that rig’s staff several weeks prior to the explosion with overall positive results. The investigations of this latest event could well provide additional empirical support for the "Mission Impossible" study results. * The study is “Safety Culture Assessment: A Mission Impossible?” The link connects to the abstract; the paper is available for purchase at the same site. ** Robert L. Cudlin, "Practicing Nuclear Safety Management" (March 2008), p. 3. Posted by Bob Cudlin 1 comments. Click to view/add.